Friday, October 21st saw Chicago hip-hop fans pack the Concord Music Hall for Post Malone’s Hollywood Dreams Tour presented by Monster Energy Outbreak. The show kicked off with FKi 1st spinning a few tunes before bringing up the first performer – Larry June. Larry June, who was full of energy, rushed onto the stage and proceeded to perform tracks from his latest project – Orange Season. Speaking of oranges, Larry took a minute in-between his set to give some of the fruit to members of the crowd. This may have been the first time some members of the audience heard him spit, but it was certain that Larry June made an impression on Chicago. In-between sets, cans of Monster Energy were given to the audience, which they happily obliged. Next up was Jazz Cartier, opening with 100 Roses – one of the best tracks from Hotel Paranoia, which is one of best projects to be released this year. Cartier’s set was anything but calm. Crowd surfing, rapping while walking the guardrail and mosh pits can describe a Jazz Cartier performance. Before closing his set with Red Alert, Jazz asked 2 volunteers to come on stage. This would lead to the two volunteers jumping from the stage to the crowd. At 10:55 pm, the crowd began to chant “We want Post”. The wait wasn’t too long as Post Malone with a can of beer in hand and a big smile walked onto the stage to the tune of the White Iverson instrumental. Post Malone looked genuinely happy to see that Chicago was rocking with him. Post kicked off with his set by paying homage to the late A$AP Yams and performed Too Young. Being there live, you could definitely tell there were die-hard Post Malone fans in the building as they knew every word to every song performed. A fan even gave Post a jersey, which he replied “thanks man, I appreciate you”. The show continued with Post Malone signature dancing and performing hits from the August 26th mixtape and his new track with Justin Bieber – Deja Vu. 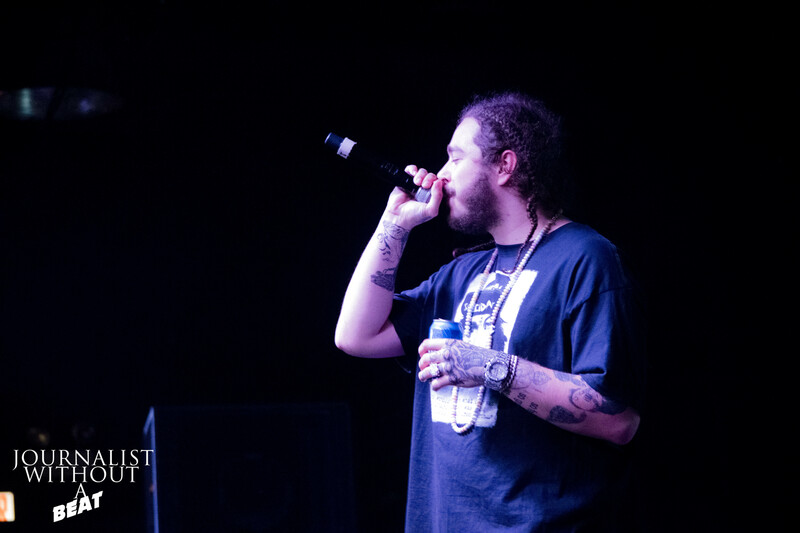 Post took a moment to address the crowd and apologize for the delay of his debut album – Stoney. He assured that the album is on its way and played a new track titled Congratulations featuring Migo’s member Quavo. Post Malone thanked Chicago for the support and closed the show with the song that brought him to the table – White Iverson. If Monster Energy Outbreak is bringing the Hollywood Dreams Tour to a city near you, definitely go as you will sure be “saucin’” the entire time. Next Next post: News | C2E2 Tickets On-Sale this Wednesday!